"By the by, it bears mentioning that Mega Man Legends 3 will be developed using Capcom’s pride-and joy MT Framework! To explain it simply, MT Framework is Capcom’s exclusive game engine. To put it even more simply, it’s sort of a set of “high-performance game-making tools” we at Capcom developed ourselves (although to be more accurate, it’s something else). Sort of a tricky subject, but I’m hoping I’ll have a chance to have the programmers tell you a little more about all that in the future." Looks like we were spot on with that one! It's a real full circle experience, Legends 3 and MT Framework. 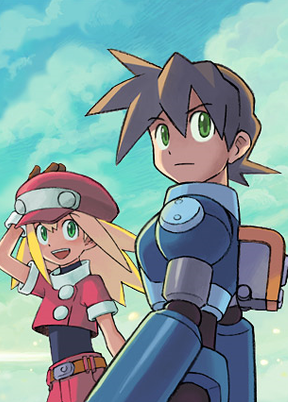 Originally conceived in 2007, the engine was actually built with a then-hypothetical Mega Man Legends 3 in mind. Three years later, that ideal is finally coming to fruition. Inafune would be proud, I'm sure. Eguchi is also teasing some big plans for this coming Friday, December 17. Being Mega Man's 23rd anniversary (and Legends' thirteenth), I think it's safe to assume we're in for some interesting developments. Stay tuned! Heh, December 17 is my birthday, so I will be there to hear out this big event. After all, Capcom is allowing the fans to help out in making Legends 3. I'm really curious on how the development team is planning to improve the already too stiffy, doubtfully well-thought Classic-3D mash-up gameplay that Legends is so commonly known for.